Leads continue to come in month after month - All year long! 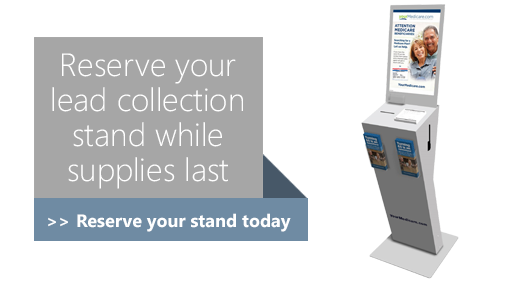 Now is a great time to increase your business by using a lead collection stand. As you can keep the appointments rolling in at half the cost of traditional lead strategies. Lead stands are CMS compliant and give you the opportunity to generate leads all year round. *Only agents directly contracted through Precision Senior Marketing for Medicare Advantage carries can qualify. Limit one (1) Lead Collection Stand per agent. You must submit your completed Qualification Form to info@psmbrokerage.com in order to qualify.